If you have been following updates of my blog, you probably recall the tutorial on those ribbon roses I posted last week. Back then I had a plan to finish the piece as a cushion. So here it is, sweet and pretty! To be honest with you, I finished it in no time at all, but it took me a while to put together the tutorial for this sewing adventure. A piece of felt with stitched ribbon roses on it. 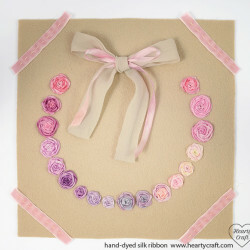 Just in case you’ve missed it, best place to get one is my tutorial on how to stitch roses with Hearty Craft silk ribbon. Pink cotton fabric for the cushion front. Any fabric that could be used for patchwork would work well here too. 1. Straighten up your embroidery edges to get a neat rectangle. 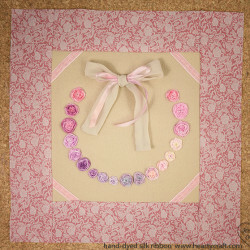 Do not cut the felt too close to the roses, as you’ll be attaching strips of fabric around the embroidery. Measure the sides of the rectangle and take down you measures. You’ll need them later. 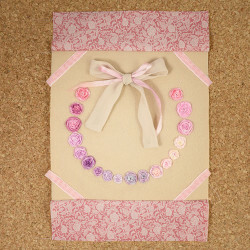 Embellish the embroidery with a piece of lace or a velvet ribbon. Hand-sew it across each corner. If you lay the cuts of fabric around your embroidered piece, you should end up with something similar to the photo above. 3. 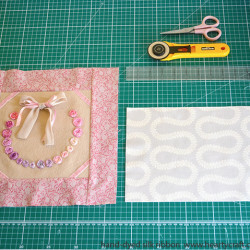 Attach two short strips to the top and bottom sides of the embroidery. Hand-sew them or use a sewing machine. Use ¼ inch of fabric for the seams. 4. Then attach two long strips of the pink fabric to the sides. Again, the seams should consume ¼ inch of the fabric. Measure the sides of the cushion front. Take down the measures, you’ll need them for the next step. 5. Cushion Back. 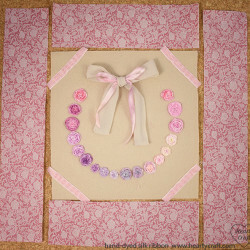 For the cushion back cut out two rectangles of the same size from the matching fabric. Make rectangles’ width to be the same as cushion front width, and the height to be ¾ of the cushion front height. For example, if your cushion front size is 17 x 20 in, then the rectangle dimensions should be 17 x 15 in. 6. 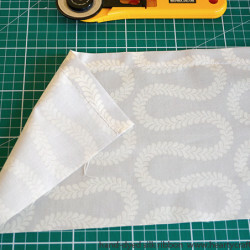 Hem one longer edge on each rectangle using ½ inch of fabric for a seam allowance. 7. Lay the cushion front piece right side up on a flat surface. 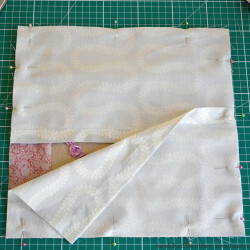 Place two hemmed back pieces you’ve got after the previous step on top of the cushion front with wrong sides up. Pin all the pieces together all the way around. Make sure the opening in the middle goes from left to right, not from top to bottom. 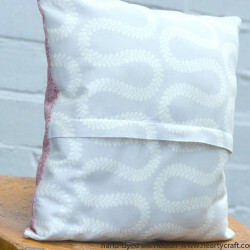 Sew the pieces all the way around the perimeter of the cushion cover using ½ inch of fabric for a seam allowance. 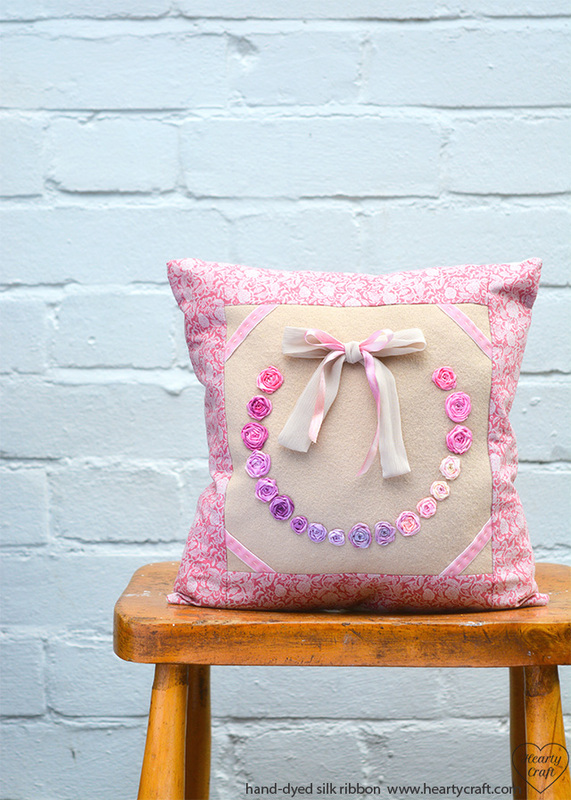 This entry was posted in Blog Posts and tagged Cushion, Free Patterns, Sewing, Tutorial on 27th July 2014 by Zinaida.